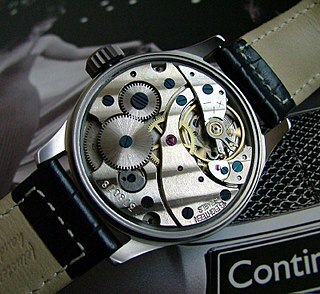 Savonette with cathedral hands and luminescent dial made by Thos. Russell & Son (probably in the 1920s). A gold pocket watch with hunter-case and watch chain. 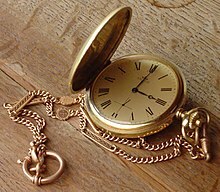 Pocketwatches evolved from clock-watches, supposedly called Nuremberg eggs, worn on chains around the neck. Example by Peter Henlein, 1510, Germanisches Nationalmuseum Nuremberg. Antique verge fusée pocketwatch movement, from 1700s. A French pocketwatch from 1920s. A Gold Chaika Pocket Watch made in the USSR in the 1970s. A so-called "mystery watch" with a transparent dial, c. 1890. It is the first transparent watch. An open-face pocket watch made by the Polish watchmaker Franciszek Czapek, ca. 1876. The parts of a pocket watch movement by B. G. Seielstad. The ca. 1950 Omega pocket watch is of stem-wind, stem-set movement. A pocket watch with an attached compass. Waltham model 1899 pocket watch movement. Colibri pocket watch, manufactured mid-1990s. The back case has an extra hinged cover that can be folded out to allow the watch to stand upright on a table. The use of pocket watches in a professional environment came to an ultimate end in approximately 1943. The Royal Navy of the British military distributed to their sailors Waltham pocket watches, which were 9 jewel movements, with black dials, and numbers coated with radium for visibility in the dark, in anticipation of the eventual D-Day invasion. ^ "Watch, Mechanical", Science and Technology, How It Works, 19 (3rd ed. ), Marshall Cavendish, 2003, p. 2651, ISBN 0-7614-7333-5 in How it Works, ISBN 0-7614-7314-9 . ^ Campbell, Gordon (2006), The Grove encyclopedia of decorative arts, 1, Oxford University Press, p. 253, ISBN 0-19-518948-5 . ^ a b Milham 1945, pp. 133–37. ^ Perez, Carlos (2001). "Artifacts of the Golden Age, part 1". Carlos's Journal. TimeZone. Archived from the original on 2007-02-18. Retrieved 2007-06-06. ^ a b Milham 1945, pp. 213–15. 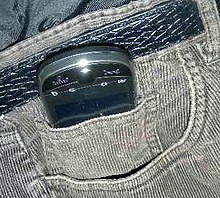 ^ "Pocketwatch". Encyclopedia of Antiques. Clocks and Watches. Old and Sold. 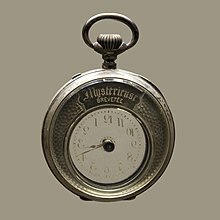 ^ "Lépine watch", Glossary, Fondation de la Haute horlogerie . ^ a b "About Watch Cases and Crowns". Vintage Watch Straps. March 2016. Retrieved 7 June 2016. ^ John E. Lodge, "New triumphs in age-old quest for perfect timepiece" in Popular Science, Vol. 119, No. 6 (December 1931), p. 53. ^ "Foundation de la Haute Horlogerie". hautehorlogerie.org. hautehorlogerie.org. October 19, 2016. ^ Van Horn, Carl (2003). Work in America. M–Z. ABC-CLIO. p. 236. ISBN 1-57607-676-8. ^ Passy, Charles (9 March 2015). "Can a pocket watch outshine the Apple Watch?". MarketWatch. Retrieved 14 October 2016. In horology, the anchor escapement is a type of escapement used in pendulum clocks. The escapement is a mechanism in a mechanical clock that maintains the swing of the pendulum by giving it a small push each swing, and allows the clock's wheels to advance a fixed amount with each swing, moving the clock's hands forward. The anchor escapement was so named because one of its principal parts is shaped vaguely like a ship's anchor. The pallet fork is a component of the lever escapement of a mechanical watch. The pallet fork and the lever form one component that sits between the escape wheel and the balance wheel. 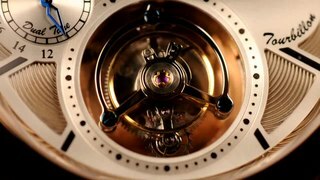 Its purpose is to lock the escape wheel, and release it one tooth at a time at each swing of the balance wheel, and also give the balance wheel small pushes to keep it going. Used in antique spring-powered mechanical watches and clocks, a fusee is a cone-shaped pulley with a helical groove around it, wound with a cord or chain which is attached to the mainspring barrel. 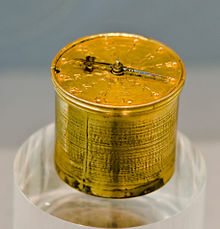 Fusees were used from the 15th century to the early 20th century to improve timekeeping by equalizing the uneven pull of the mainspring as it ran down. 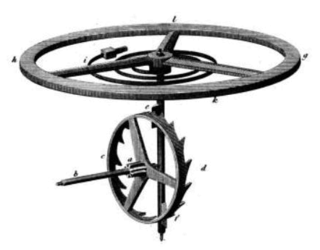 Gawaine Baillie stated of the fusee, "Perhaps no problem in mechanics has ever been solved so simply and so perfectly."